(HOST) Despite her best efforts, Commentator Deborah Luskin is never quite ready for spring. (LUSKIN) I know a lot of Vermonters are tired of winter and ready to see the last patch of dirty snow disappear. Not me. Despite our diligence, we’re still a long way from the bottom of the freezer. It will be a near thing if we finish last year’s rhubarb before this year’s is up, and even if we eat stir-fries every week from now until June, we’ll still have snow peas in the freezer when the next crop comes in. It’s not the first time we’ve ended up with last year’s harvest unconsumed. Other years, we’ve put up food and forgotten about it, or been seduced by the fresh produce in the store. Not this year. This year, we virtuously walked past the mouth-watering displays of frilly kale and colorful chard at the supermarket, defrosting lumps of our homegrown greens, instead. We’ve been valiantly chipping away at two freezers’ worth of green beans and raspberries and chickens, but we still have a long way to go. Part of the problem is that Tim and I garden as if the kids still live at home. In truth, it’s just the two of us these days, and between meetings and our work, one chicken roasted on the weekend lasts most of a week. Our increasing competence as gardeners also contributes to our troublesome bounty. In July, when the beans are upon us, we put them up as if they’re the only vegetable we’ll eat for the rest of the year. Then we continue harvesting cold hardy crops right up to Thanksgiving, and storing root crops well into winter. But the truth is, the same impulse that drives us to grow and store our own food for the winter also prompts me to hoard it. I recognize that I’ve inherited Depression Mentality from my parents, who lived through the Great One of the 1930s. But it’s not just cultural; it’s also genetic: I come from peasant stock, and I’m physically predisposed to store fat against famine. I think my freezer is just an extension of my DNA. This year, my Passover plan is to defrost a leg of last year’s lamb, and maybe roast a chicken or two, along with an ample side dish of snow peas. There’s a famous line in the Seder that translates, "Food has not failed us." It’s a celebratory feast, and one that’s as much about food as it is about freedom: At Passover we eat unleavened bread and bitter herbs while remembering the manna that fell from heaven to sustain us in the desert. At my house, manna comes from the deep freeze, and as soon as the ground can be worked, we’ll start planting to fill it for next year. And while I’m ready to mothball my winter coat, I’m not quite ready to trade in my snow shovel for a spade. 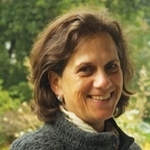 (TAG) You can find more commentaries by Deborah Luskin at VPR-dot-net.